Quote: The B-41 (also known as Mk-41) was a thermonuclear weapon deployed by the United States Strategic Air Command in the early 1960s. It was the most powerful nuclear bomb ever developed by the United States, with a maximum yield of 25 megatons. The B-41 was the only three-stage thermonuclear weapon fielded by the U.S. The B-41 was the only three-stage thermonuclear weapon fielded by the U.S. It had a deuterium-tritium boosted primary, probably with lithium-6-enriched deuteride fuel for the fusion reaction in the secondary stage. This was followed by a yet-larger third fusion stage, the tertiary stage, compressed by the secondary stage. Finally, there was a fission jacket. Two versions were deployed, Y1, a "dirty" version with a tertiary stage encased with U-238 (natural uranium), and Y2, a "clean" version with a lead-encased tertiary. It was the highest-yield nuclear weapon ever deployed by the United States, with a maximum yield of 25 megatons (Mt), and weighing in at 4,850 kg (10,690 lb). It remains the highest yield-to-weight ratio of any weapon created. The US claimed in 1963 that it could produce a 35 Mt fusion bomb, and put it on a Titan II (3,700 kg [8,200 lb] payload), almost doubling the yield-to-weight ratio of the B-41. The B-41 was of the usual long cylindrical shape. The nuclear fusion warhead was of the Teller-Ulam type and used a 40–100 kiloton implosion type nuclear fission primary (reportedly based on the Smokey TX-41 shot of Operation Plumbbob) fueled by HEU to trigger the lithium-6 deuteride fusion fuel. The Y1 version, the third ("tertiary") stage was enclosed in a uranium tamper. 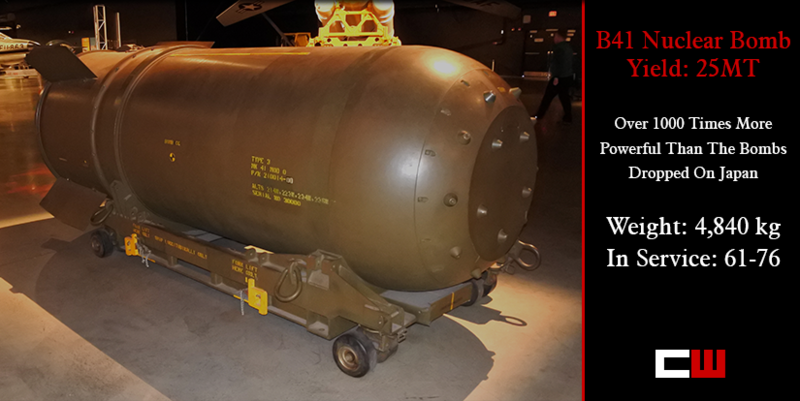 The B-41 was an example of a fission-fusion-fusion-fission type thermonuclear weapon, or tertiary stage bomb. The additional tertiary fusion stage, compressed by a previous fusion stage, could be used to make a bomb with yields as large as desired. The B-41 (designated Mk-41 until 1968) entered service in 1961. About 500 of these weapons were manufactured between September 1960 and June 1962. The B-41 was progressively phased out of service beginning in 1963, superseded by the B53 nuclear bomb. The last B-41s were retired in July 1976. The Castle Bravo test gave me the chills and that one was only 15MT. So pretty much half the yield of the Tsar Bomba. Sheesh. (09-06-2017, 07:28 PM)agentmulder Wrote: The Castle Bravo test gave me the chills and that one was only 15MT. So pretty much half the yield of the Tsar Bomba. Sheesh. 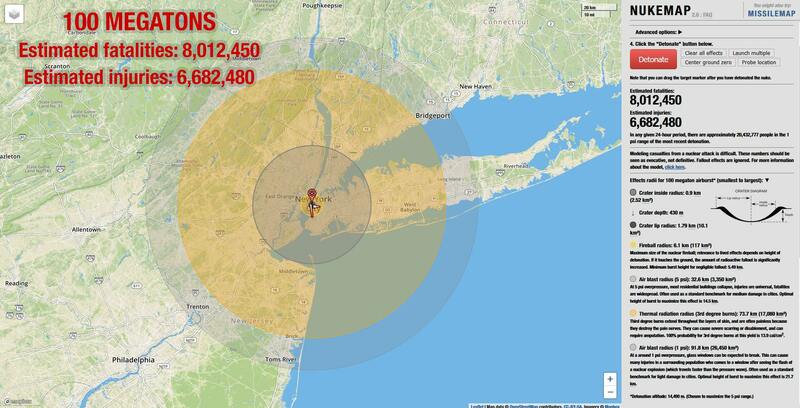 According to the Russians, even though the Tsar Bomba was detonated at 50MT, it was capable of a 100MT yield.